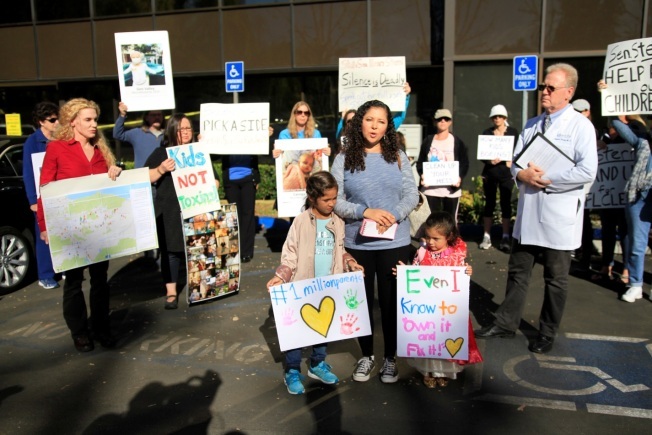 Families picket for a full clean up of the Santa Susana Field lab on Thursday, Nov. 30, 2017. Nearly two dozen parents and activists are demanding that toxic contamination from a former nuclear and rocket testing site in the hills above Simi Valley get fully cleaned up, and they're asking their local state senator for help. 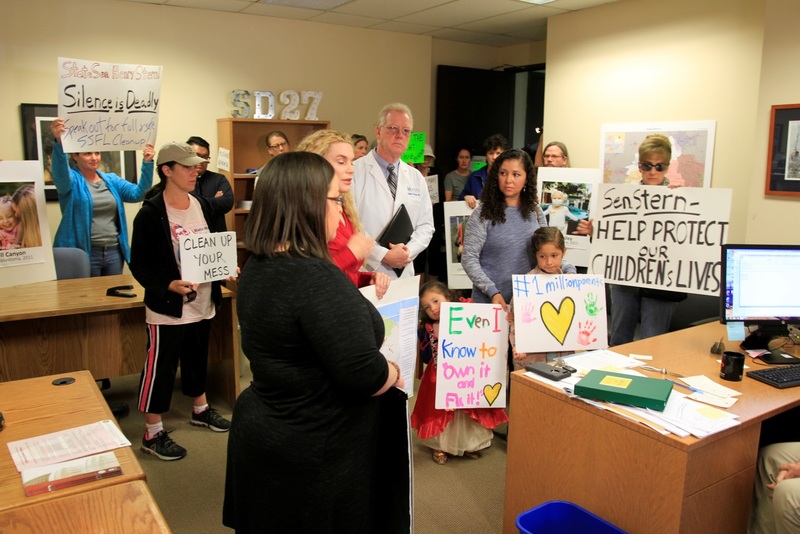 The group gathered in front of the office of California State Senator Henry Stern on Thursday morning, calling on him to intervene in the decades-delayed cleanup of the Santa Susana Field Lab (SSFL). "Children are not only getting sick with cancer, they're also dying from cancer, and it's ridiculous. We're here to call attention to this to ask our elected official to also speak up and advocate for our communities," said Maggie Compton, who believes radioactive and chemical contamination from SSFL contributed to her son getting a rare childhood cancer. 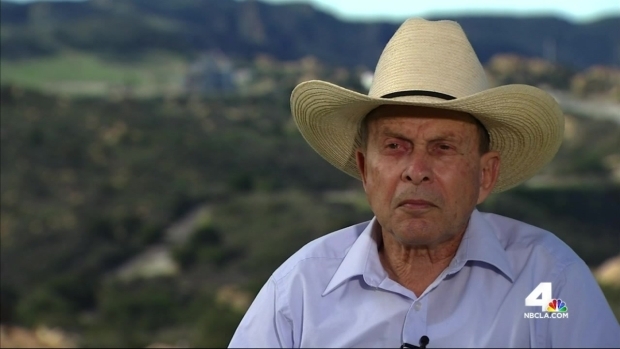 For years, the NBC4 I-Team has been uncovering "LA's Nuclear Secret." 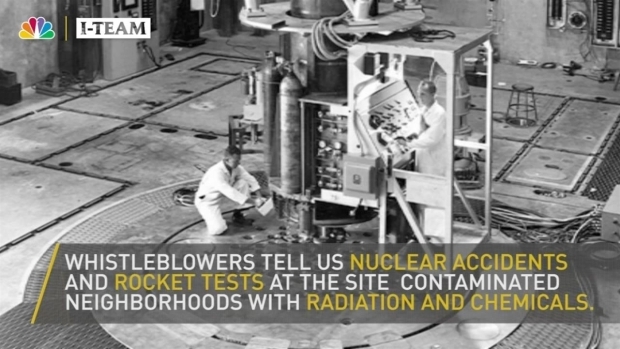 Whistleblowers and thousands of pages of official documents revealed numerous nuclear accidents at the SSFL, including a 1959 reactor meltdown, as well as the release of hundreds of thousands of gallons of toxic chemicals into the environment stemming from decades of rocket tests. The NBC4 I-Team has been covering LA's nuclear secret for years. Today, thousands of community members are asking a state senator for help in getting one of the most contaminated properties in California cleaned up. Carrying signs and a petition bearing more than 24,000 signatures, the group delivered their plea for a complete cleanup of the Field Lab to a staff member of Senator Sterns. As they filled his office lobby, one parent told the Stern staffer, "We have tried to follow up. We've tried many times, and the community now has had enough. We want him [Senator Stern] to be a strong advocate for the full cleanup for their health as the first priority." Senator Stern was not in his office at the time, but NBC4 spoke to him last month at the Pierce College Day of Politics event. He said he has concerns about how the California state agency responsible for the cleanup of the SSFL, the Department of Toxic Substances Control, is handling the process. The agency recently released a report that laid the groundwork for a future cleanup and Stern says it lacks important data. "It doesn't give enough information to me, to the community, to be able to make good decisions," Senator Stern told NBC4 in October. "I'd like to see DTSC actually go do the work, engage the community, and do the detailed work we need to get that thing back to background." The Senator says he plans on holding the agency accountable. "My job is to keep their feet to the fire and keep pushing and that's what I'm committed to doing," said Senator Stern. The parents at today's protest say they haven't seen evidence of Stern's involvement and they fear the state will allow much of the contamination to remain at the site. They want Stern to take a more public position on the cleanup. "I want this cleaned up it's been over half a century, and they haven't done anything to clean it up and they're still fighting over cleaning it up rather than just sticking to the agreements that they've made in the past to clean up the site," said Compton. The petition was started by Melissa Bumstead, a West Hills resident, who believes that toxic contamination from the Field Lab contributed to her daughter Grace being diagnosed with a rare leukemia at age 4. Now almost 8, Grace relapsed in August and is currently undergoing treatment at Children's Hospital Los Angeles. 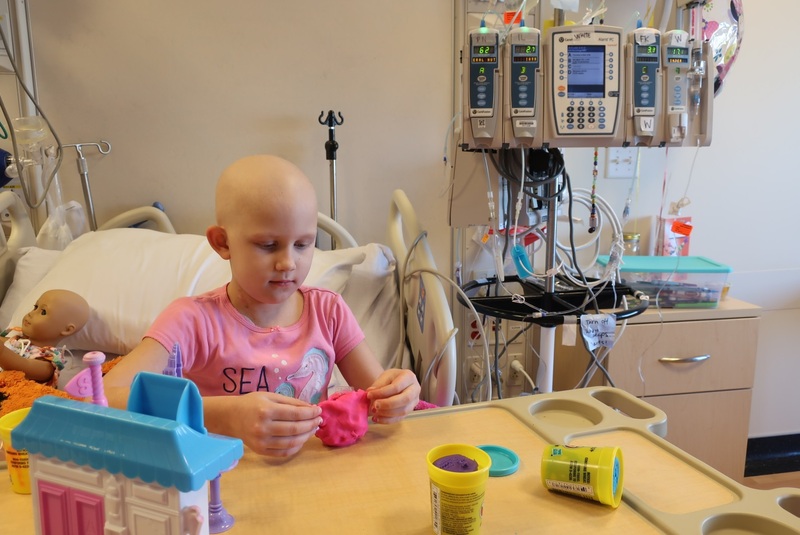 "More than anything, I wish I could make my daughter's cancer stop, and for her sake I will continue to bring awareness to the dangers of the Santa Susana Field Lab," said Bumstead. Bumstead says she met other parents at the hospital who lived near the Field Lab and whose children had developed rare pediatric cancers. A 2007 Centers for Disease Control study found that people living within two miles of the Santa Susana site had a greater than 60 percent higher rate of some cancers. "I created the petition in hopes that if one million parents helped show their support for our kids that politicians and the DTSC would feel the national pressure and enforce the complete cleanup of all the nuclear and chemical contamination at the SSFL," explained Bumstead. The NBC4 I-Team recently took an in-depth look at the progress of the cleanup. While the parents at today's protest want the SSFL fully cleaned up, we found that the complete removal of all of the contamination is unlikely based on the state's current plans. Click here to read our complete coverage of LA's Nuclear Secret. "There's a lot of fear in the community that rightfully remains as this cleanup planning effort trudges along. 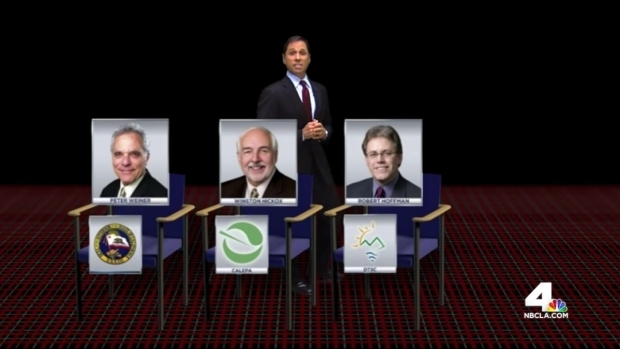 This draft EIR leaves way too many critical questions unanswered and DTSC should dig deeper. From detailed soil analyses to innovative transportation solutions for hauling off toxic soils, the Department has yet to analyze the technical facts on the ground enough for me (or the public) to form a final opinion on exactly what the final cleanup plan should be. While I'm no scientist, it doesn't take an expert to know that this document is not going to rebuild the trust that has been eroded over the years."